Navigate to the Pages menu on the left panel. Determine if you would like your “parent” item (the item that triggers the dropdown) to be a clickable link or not. Existing pages are clickable and can be used as your top level item. If you would like your top level item to be non-clickable, you must select “new page” and add a “folder” as the top-level item. Drag and drop existing pages on your site beneath the parent page. They will indent slightly to the right indicating they are now a sub-level page. 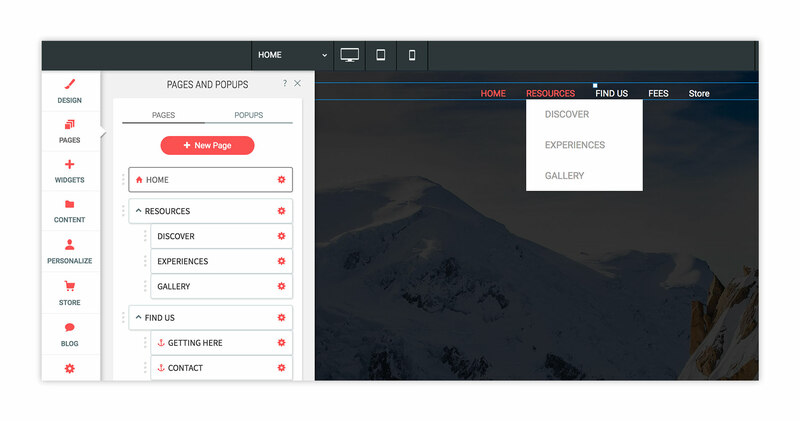 Hover over your navigation items to review the dropdown style. Style settings can be modified by right clicking the item and changing design options.